The Faizabad sit-in is a worrying example of the state and government being held hostage by a religious group largely obscure until now. 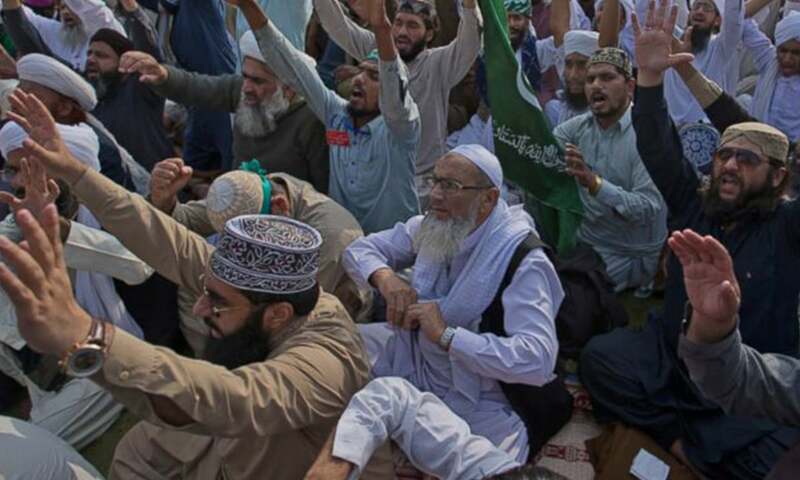 Thousands of green-turbaned religious foot soldiers of the Tehreek-e-Labaik Pakistan (TLP) have managed to paralyse Islamabad and Rawalpindi since November 8 by blocking the main link between the twin cities interprovincial traffic. They are led by Khadim Hussain Rizvi, a religious leader whose entry in the federal capital was banned by the government in September this year. Hundreds of thousands of commuters use the Expressway to enter the federal capital from areas on its periphery every day. Even on the best of days, a minor accident or blockade can result in miles-long traffic jams. The sit-in of religious zealots over a change in law that has already been reversed is a diversion the government is neither prepared nor willing to tackle. The government and city administration started out by deploying huge containers on main roads to block the influx of protesters. This threw traffic into a tailspin. By the morning of November 9, patients were unable to get medical attention, students could not attend classes and people could not make it to their workplaces. The demand to reverse a change in the law pertaining to the finality of prophethood has already been accepted. But the TLP group is vying to raise its public profile. It joined electoral politics and bagged over 7,000 votes in the by-polls for NA-120 following Nawaz Sharif’s disqualification. Since the right-wing Pakistan Muslim League-Nawaz (PMLN) is concerned about religious parties like TLP causing a dent in its vote bank, it earlier refused to acknowledge the group’s legitimacy by either negotiating with them or confronting them directly. But its policy of waiting for the protest to fizzle out did not work either. The government has now invited representatives of the TLP for talks after a violent clash between protesters and police left several people injured last Tuesday. The government’s inaction is seen as a sign of weakness by its opponents. “They are not in control. They are very weak," says Fawad Chaudhry, spokesperson for the Pakistan Tehreek-e-Insaf (PTI). 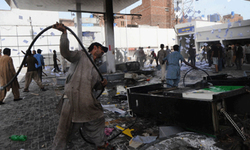 He claims the crisis could have been easily averted with strict administrative measures. "We see a clear distinction between a legitimate political cause for which the Constitution grants you the right to protest and illegitimate political causes which cause chaos in society," he says of his own party’s stance. 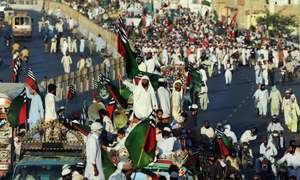 It was, however, the PTI’s 'dharna' in 2014 that paved the way for religious groups to march to the capital to protest and press for their demands. 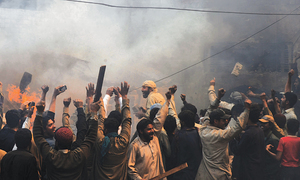 The violent protest over the hanging of Mumtaz Qadri, who assassinated Punjab governor Salman Taseer, in March last year also paralysed the capital and inconvenienced commuters in a similar way. Though Chaudhry insists a “strong government” would be able to tackle such groups with ease, any future PTI-led government would be subject to the same vulnerabilities and pressure. The PTI and PMLN share the right-wing vote bank in Central Punjab and do not want to alienate conservative voters over sensitive religious issues. The clergy, on the other hand, is disconnected from society and its problems. In its fight to preserve orthodoxy, it is pitting orthodoxy against the interests of ordinary people. The protesters do not even see themselves causing any trouble to commuters. "Our sit-in and protest should not be blamed for the trouble of the city’s people … it’s the government which is responsible for blocking roads and creating problems," says Muhammad Bilal, a personal aide of the firebrand Khadim Hussain Rizvi. "We have only one demand: remove law minister Zahid Hamid from office as he is the one responsible for amending the affidavit that contained the clause about the finality of prophethood," Rizvi said while addressing protesters at Faizabad. "If you don’t remove Zahid Hamid, we don’t care if the whole assembly dies." The writer is a special correspondent for Dawn News and tweets @Umer_1967. Khadim Hussain Rizvi is not banned. If he is banned, then why some media channels are taking his interviews. Secondly, if political parties can march against govt. for their demands like PTI and other parties did, then why not religious party This is their democratic right It clearly shows how biased above info is written ! They talk about the minority rights but not unbiased to see religious parties rights. Completely agree with the point you made. The government's, and dare I add the media's double standards are on full display here. As long as the protest is peaceful, they have every right to organize. It is incumbent on the local governments to facilitate the public and arrange alternate detours for traffic etc. I hardly see any green turbans in the above picture as mentioned in the article. I also wonder how my countrymen have time to waste on these dharnas. When do they go to work and when do they pray salat? @Waleed Ahmed well to correct you it has always been the religous parties that have taken the capital hostage not the political parties even in the inital dharnas the political parties staged a peacful demonstrations and the religous parties assaulted the parliment. last time when PTI came to protest in the capital they got permission from the court. 5000 people are holding hundreds of thousands of people in twin city hostage, hello, what is taking the government so long? People are losing wages, kids are missing schools and the shop keepers are losing sales, never mind, the politicians get paid no matter what. Above information is totally one sided, wrong and biased. @Waleed Ahmed. Dear Waleed, Please go and seek advice from a competent psychiatrist. The government of Pakistan is showing that it is weak; the PML-N is showing that it cares more about the votes of religious parties than the rule of law, public safety, and the rights of ordinary citizens of Pakistan. These protesters are holding thousands of citizens hostages of their political and personal goals. Clear them out of public access and a government site!